Who Are You Without Your Eating Disorder? Sometimes Instagram really is a place filled with so many beautiful things. Quotes are one of my favorite things to read and discover because they can get you thinking about things differently or help you feel understood in all of 15 words. I saw this quote by Atticus on Instagram this week and I thought it applied to eating disorders so tragically. One of the things I hear from almost all of my eating disorder clients is how fearful they are of knowing themselves without their eating disorder. They have, as the quote says, given so many pieces of themselves to the disorder that they aren’t sure who they will be without it. It is true that after enough time so much of how you know yourself is tangled up in you being sick. It affects how you connect with others, how you socialize, how you spend your time when alone, the way you think and in a lot of ways, how little you authentically get to feel. I often refer to eating disorders as an abusive partner. Their promises are intoxicating and their blows can be lethal. Both of which cancel the other one out when we are in the grip of it. In recovery, one of the greater leaps we have to take is towards the unknown recovered life we want. It is true that you won’t know exactly who you are without your disorder but you have to stop protecting yourself with something that is trying to kill you. There is nothing safe about that. I have felt at the edge of this cliff of unknowns at different times in my life and felt absolutely terrified. In retrospect, not knowing allowed me to just become more of who I really am instead of more of the labels I thought I needed to be or should be in order to be loved and accepted. 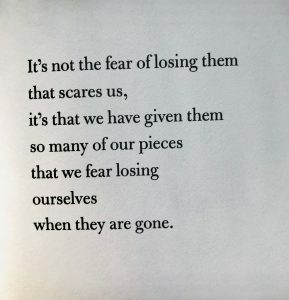 I think it’s important to not worry about all the what ifs and the fear of living without it, and instead focus on how you can regain the pieces of yourself that make you, you so you can feel whole again on your own without it. What piece are you going to focus on next?